Dorgard with FREE SHIPPING and free extended 5 Year Warranty from Safelincs. The Dorgard is a safe and legal solution that allows you to hold your fire doors open safely, while automatically closing them in the event of a fire. This allows for better wheelchair access, ventilation and all-round convenience without jeopardising safety or breaking the law. Dorgard has a rubber plunger/stopper which remains in contact with the floor and, unlike magnetic fire door retainers, can hold the door open in any selected position. 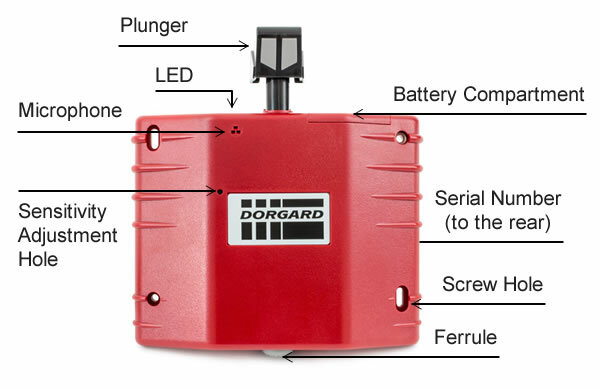 When a fire alarm sounds, the integral audio-electronic device inside the Dorgard signals the plunger to retract, allowing the fire door close normally (Dorgard will release after approximately 14 seconds). Dorgard is battery powered, so there is no need for complex and expensive wiring into the building's fire alarm system. This means that the Dorgard can be installed and operated alongside any existing fire alarm system currently in place. Please note that your alarm's sound level has to be higher than 65dB at the location of the door to ensure that the Dorgard is able to pick the alarm up. This is also the required alarm sound level for populated areas according to BS5839-1:2002 (Clause 16.2). Installation of the Dorgard is very simple. 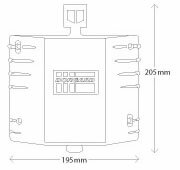 The Dorgard floorplate is designed for use with an installed Dorgard and is fitted to the floor using 4 screws. Fire doors weighing more than 120Kg, which have a closing force in excess of 120nm (that is a force of about 15kg, 800mm from the hinge) must have the floorplate installed in combination with the Dorgard unit. Dorgard can hold a fire door open safely without the floor plate installation if the fire doors weight and closing force are less than that above. Your fire door has a powerful overhead door closer and the fire door tends to creep closed even with a Dorgard fitted. The floor is slippery or has a very smooth surface and the fire door tends to creep closed even with a Dorgard fitted. This is the technical data for the Dorgard Fire Door Retainers . Excellent Product Very easy to install, great product. Will definitely use again. Great service from Safelincs. Neat product. Easy to close . Thank you Hopefully will not need it in a real fire situation. Easy to fit and tweak to suit fire alarm sound level. Works well but needs a foot adjustment The height position of the device on the door is critical as there is no adjustment on the rubber foot. Sloping floors are extremely difficult and need the stop to be built up. It's simple but effective. Great for when you can't wire in direct to the fire alarm system. Couldn't wish for better. Excellent product and service. Great product, delivered quickly and excellent response when I needed some technical advice relating to the product. Have these on every firedoor in the practice and they are excellent. The dorgards (5 in all) were easy to fit and seem to work impeccably. Good quality at a fraction of the price of alternative, post fit door release systems. Can be a little over sensitive to background noise and activate themselves, but that may not be a bad thing. Perfect solution to holding office fire doors open to warehouse that close when alam sounds We have to have the doors open in summer as office too hot and also when processing contents of boxes being carried in and out of office. The doors need to be closed in a fire situation and this has been a perfect solution. They are tested each week as part of our fire alarm test procedures. excellent fire door closures. React well to alarm & close doors immediately. Does exactly what it says on the box... Our venue has dozens of heavy fire doors so these things are a godsend when we have to move stuff around. There ok but are easily damaged Would be good if you could get spare and they were easy to change , i.e. the plunger. Great product, easy to install, ordering more. Easy to install, do the job perfectly It's a shame they don't have more programmability with timers and the internal clock, but otherwise they work just as needed. Works perfectly, easy to fit. When testing it, note that it needs a few seconds of alarm sound before it responds. The visual instructions don't make this clear and I ran a few tests before realising. Good product the only problem is it recognises continuous sound as a fire alarm, which isn't so great when someone rings our door bell a lot, because it closes the door. But that's ok.
Good product - as described Easy to install. Word of warning - timer can only be set by installing the batteries at midday! The Dorgard does what it is supposed to do and holds a fire door open but closes the door when the fire alarm is sounded. The Dorgard is easy to install and you can set the timer so the Dorgard closes the door at a set time every night. Great product, easy to install. Very good service. Simple solution to a everyday problem, but also keeping everyone safe at teh same time. It works This product works perfectly well but the stopper mechanism feels flimsy and doesn't always engage first time when depressed hence only the 4 stars. Great safety gadget. Does the job well. Works fantastically. Very easy to install. Exactly what was needed and works well. easy to install and works very well. The dorgards are just what I ordered. Delivered fast. My new dorgards are exactly what I wanted in the colour I wanted and I have just had one of my old ones repaired. What an exceptional service from your company. Thank you. ideal for purpose-outstanding,giving peace of mind to user. Excellent product and easy to fit and set up Great service from SafeLincs. Dorgard arrived promptly and was easily fitted. Set up was straight forward with sensor level being set as part of our weekly fire alarm test. I love these door retainers! Excellent devices! Have installed 6 in total, simple to fit, works like a dream and is a great solution to the problems and arguments caused by fire doors being opened/closed at the wrong time (kitchen door for instance, carrying coffees etc, the door can now be open but we know we are covered in the event of a fire). I thoroughly recommend them. Does what it says on the tin!!! I have used these in a couple of places where I have worked and they have always been succesful. They save the cost of an electrician to wire in and extend the system connected to the fire alarm, yet do an equally good job as long as a sounder is close by. The simplest option to achieve compliance that I've seen They hold, even in kitchen / print room areas & release point that was preset works perfectly. We have zero nuisance releases on 4 installed units. This was a much better solution than spending ££££ in a hard-wired addition to our system as offered by the landlord's contractor. Good little units if installed correctly and used correctly Dorgard Retainers are a good alternative to wired magnet retainers and if installed correctly can solve the problem of door retention. The users need to understand the capabilities of these products and use them correctly. Does what it says on the box!!! Easy to install and they work! I installed three within half an hour. The option to alter the noise sensitivity is very useful to stop them closing every time there's a loud noise like a vacuum cleaner. excelent piece of kit and great value for money. Once the timing mechanism was understood, the product worked well. Very simple to install and use. This was bought to replace a similar item that had developed a fault, but was several years old. Delivery was the following day, it was easy to install and the instruction booklet has been improved compared to the original. The timing mechanism is a boon allowing the elderly freedom of movement until they are all in bed....or should be, without the need for staff to close doors at night. excellent product that works really well....every fire door should be fitted with one! Perfect just waht we needed. Excellent item. Well made and easy to fit. Ideal for purpose. Excellent product we purchased some last year and are very impressed with them so de3cide to buy more this year. Easy to operate and provide peace of mind. good product with no competition. Works as documented. It was strange after a fire risk assessment to have all the fire doors shut. Out offices are not well ventilated and it was worse with them closed. I thought the dorgards were expenses as I had to buy two, one for each end of the office. They were easy to install and the demonstration video on safelincs website was really helpful to understand how they worked. After installation, I tested the alarm and they worked straight away. Absolutely amazing devices and well worth the expense. This is the second such unit that I have fitted and beleive this to be a very good solution both for cost and simplicity yet fully compliant with fire safety requirement. Excellent - does the job and easy to install. Thanks. Pleased with product does what it says. Does just what is says on the 'tin'. Good product and simple to fit. Thank you for dealing with the purchase so promptly, I would buy from you again!